Okay, here is an article written by Mike Sessler about how to build a portable sound system for church. Of course, this would also work for any kind of group or use. This article is a great find for me personally as I am helping out with a small project at my kid's school. 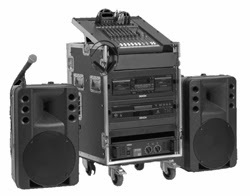 The school currently has a portable, rolling rack sound system that is in need of some TLC and upgrades. I will be working with the teacher who is the "tech person" at the school to help solve the problems with the current system to make things work better. Since most schools have limited funds for purchasing things like new sound gear, we are going to do a little searching to see what kind of quality, used gear is available that would work for the upgrades and fixes to the current system. The sound system will remain as a portable style setup to keep things simple for the time being. In the future, the school would like to consider a permanent sound system installation once funding can be allocated to do so. Both my kids attend the public school which has a standard gymnatorium venue which is essentially a gymnasium with a proscenium style stage at one end. There is so much potential for this venue and I am going to volunteer my time with the school to help them out with their sound system issues. Here is a picture of the gymnatorium at the school.